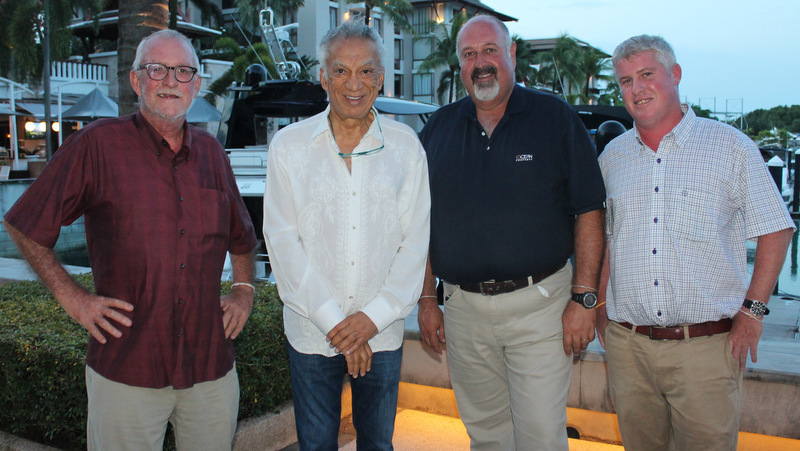 Strong together: (from left) Phuket Yacht Show organiser Andy Dowden, Royal Phuket Marina CEO and Founder Gulu Lalvani, Ocean Marina Yacht Club Harbour Master Scott Finsten and RPM Marina Manager Ben Mccrory. The news was the main announcement at the monthly Grow Boating networking event for Phuket’s yacht charter and boating industry, and throws down the gauntlet to the Thailand Yacht Show, which held its third edition at Ao Po Grand Marina in February – its second venue in its three years. Confirmation of the forthcoming Thailand Yacht Show has yet to be announced. As to the Phuket Yacht Show, speaking to a very healthy turnout of leading figures in Phuket’s boating industry at RPM last night, Mr Dowden explained that the show had gained the support of new investors – and a strong contingent of sponsors including the Tourism Authority of Thailand (TAT) and the Thailand Convention & Exhibition Bureau (TCEB). Mr Dowden for nearly two decades has led the charge for Phuket to be focus of a boat show in Thailand under the Phuket International Boat Show (PIMEX) banner. The show last year* attracted 5,000 visitors from over 60 countries, 100 companies from over 40 countries and 50 yachts in the water with more space for superyachts. Mr Dowden maintained that the first week in January was still crucial to the success of the show, a factor debated in other events. “This is when the High Net Worth Individuals (HNWIs) are on the island and other quality potential customers and clients for Phuket’s boating industry,” Mr Dowden said plainly. Superyachts will again feature strongly with a private event set up at Koh Rang Noi. “Last year we had four to five superyachts, this year we are looking to improve on that. We have strong support from the owners of the venue at Koh Rang Noi, for that we are very grateful, and will be hosting a private event there, which is only 10 minutes away by tender,” Mr Dowden noted. The Phuket Yacht Show will be comprehensive in its appeal, with a variety of lifestyle events, entertainment and food-and-beverage attractions to be hosted along the boardwalk at the marina. For this Russell Chew has been brought on board for the event. “Technically he is the Events Director at RPM, and Gulu has very graciously offered him to provide his services for us,” Mr Dowden explained. “Mr Chew has much experience in Singapore with the previous team and with organising the Singapore Rendezvous**,” he added. The show will also move forward in its appeal to the smaller operators in the marine industry and associated businesses. “For years I have had the feedback that in addition to all the boats on show and the entertainment provided, to be a true boat show we need to have a lot more of the smaller marine industry providers, and this year we have taken a big step forward in that direction,” Mr Dowden explained. “Not everyone will be buying a boat… People need something small they can take home at the end of the day, a keychain, a fishing road, something,” he said. “That’s we this year we are reaching out chandleries, sports equipment providers and the like to get them to join the show. We will even be offering very big discounts to take part,” he said. Charter focus will also be strong, and monthly boat rallies from RPM will continue to support and develop the local industry. “Those who buy or want to charter boats can join these rallies and enjoy a great day on Phang Nga Bay, right on our doorstep,” Mr Dowden said. Highlighting his very strong involvement in RPM continuing to be the venue for the yacht show, Mr Lalvani explained that the new investors already had extensive experience in hosting boat shows in the Mediterranean. Without naming the new key investors in the show, Mr Lalvani did explain that they had been deeply involved in holding successful boat shows in Turkey and had recently relocated to Phuket. The statement received welcome applause at the event last night. A clear sign of the co-ordination of the boat shows in the Gulf of Thailand and in Phuket, Scott Finsten, Harbour Master at the Ocean Marina Yacht Club, opened the evening’s presentation. 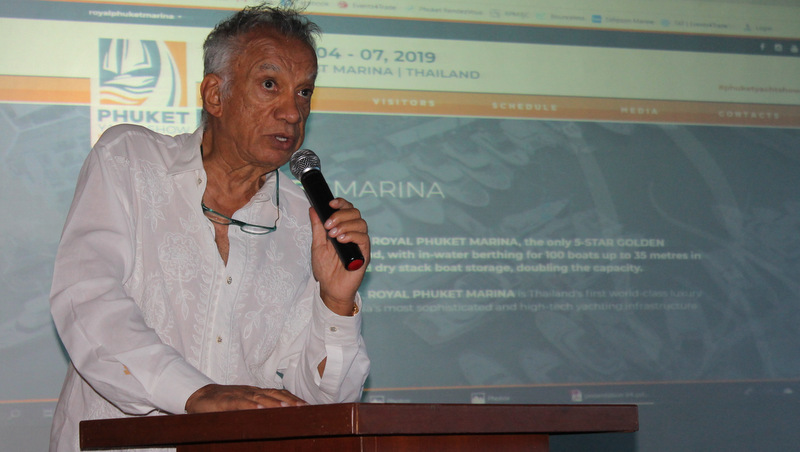 The Ocean Marina Yacht Club is surging forward in its role in hosting the Ocean Marina Pattaya Boat Show, and the Ocean Marina now had 440 berths, Mr Finsten said. “Our expansion has seen 200 berths added over the past six years,” he noted. “The boat show is the perfect event for us to fill the marina and boat offices and marine services have benefited from it,” he added. Mr Finsten noted that Bangkok “is the growing market” for the Ocean Marina Yacht Club. “They come down (from Bangkok) and charter yachts on weekends – these are our future yacht owners,” he said. In other strong positive news for the boating industry announced last night, RPM Marina Manager Ben Mccrory explained that the years-long dredging of the access channel to RPM was finally complete. “The channel has been dredged to two metres depth at lowest tide,” Mr Mccrory said. “This allows 24/7 access to the marina for powerboats up to 35m in length,” he noted. CORRECTION: ** Not the Singapore Yacht Show as originally reported. The error is regretted.